DETROIT, Mich.-Tuesday marked another duo of signings for the new Mustangs track & field program. 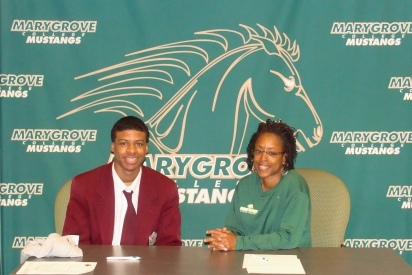 Tristian Lewis, a senior at Detroit’s Winans Academy, signed a 2010-11 Letter of Intent inside the Wellness Center at Marygrove College. Lewis is a 5’8″ well-rounded athlete that spent most of his high school career on the track and basketball court for the Winans Academy Saints. The talented runner participated in the 100m and 400m races, along with a relay appearance in the 4x100m. He is a recipient of many medals and trophies over the course of his illustrious running career. On the hardwood, the four-year guard averaged 9.8ppg. Coach Womack on Lewis: Tristian is a hard working runner with a great attitude. He will be as good as he wants to be in a Marygrove uniform. We are pleased to welcome Tristian to the Mustang Family!